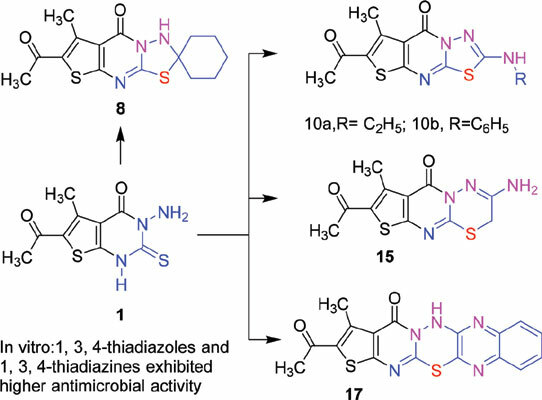 Background: 1, 3, 4-thiadiazoles, 1, 3, 4-thiadiazines and thienopyrimidines have newly attracted attention due to their forceful pharmacological activities. They showed antimicrobial, antiviral, analgesic and anti-inflammatory properties. Objective: The aim of this research is to synthesize new thiadiazolothienopyrimidines (2-10), thienopyrimidothiadiazines (11-15), quinoxaline-thienopyrimidinones (16) and thienopyrimido- thiadiazinoquinoxalinones (17) via effectual high yield procedure for assessing their antimicrobial activity. Method: A series of new 1, 3, 4-thiadiazolothienopyrimidines, thienopyrimidothiadiazines and thienopyrimidothiadiazinoquinoxalinones was prepared from 6-acetyl-3-amino-5-methyl-2-thioxo-2, 3-dihydrothieno [2, 3-d] pyrimidin-4(1H)-one (1) as the beginning material. Results: The 1, 3, 4-thiadiazoles, 1, 3, 4-thiadiazines derivatives (1-17) were synthesized in adequate to good yields (60-85%) in a stepwise effectual procedure under condition. The chemical structures of these new compounds were confirmed via many spectroscopic techniques as UV, IR, NMR, mass spectra and elemental analysis. In vitro, antimicrobial was evaluated for the synthesized compounds using minimal inhibitory concentration of these compounds against bacteria and fungi. Conclusion: The 1, 3, 4-thiadiazole and 1, 3, 4-thiadiazine derivatives (15-17) exhibited higher antimicrobial activity (Gram-positive, Gram-negative bacteria and fungi) compared with the standard antibiotic drugs; Levofloxacin (Tavanic) and Nystatin. 1, 3, 4-Thiadiazoles, 1, 3, 4-thiadiazines, thienopyrimidines, spiro-cyclohexane, quinoxalines, antimicrobial activity.